Flagship independent quarter business Scoots, Suits and Boots has announced it will close by the end of January. This comes fast on the heels of news that Frilly’s will close after thirty years in business. It is time Labour Oldham politicians most notably MP Jim McMahon and his council leader successor, Jean Stretton, were held to account for the excessive costs of multiple business, regeneration and social project’s that fail businesses and the Oldham people. Oldham Council’s sanitised and inaccurate projection of a booming Oldham town centre really does fail the independent businesses that are tempted by OMBC’s future pot of gold at the end of the rainbow scenario. Earlier today, before we found out about the closure, we compiled a list of quotes from the Greater Manchester Spatial Framework documents regarding Oldham. Time and time again the document identified the Oldham Town centre wards as having anomalous characteristic’s, everything from ethnicity to age group percentages, gender inclusion discrepancies to economic activity levels or the lack of them. It may not be PC but we would not open a business within the economic quagmire Labour Oldham have created in Oldham town centre through decades of political and economic policy mismanagement. Here are some of the spatial framework quotes we highlighted on Twitter earlier today. The first three quarters of 2016 have delivered record numbers of foreign migrants to the Oldham town centre wards with over a third coming from Romania. In the 3 years from August 2013 to August 2016 the number of families with 5 or more children claiming housing benefit in 029 grew by 225%, in 024 by 173.3% , in 019 by 162.5%. The number of families with 4 children claiming housing benefit increased by 95% in 019, 78.8% in 023 and 150% in 017. In August 2016, St Mary’s (014), Hathershaw (029) & Coldhurst (016) accounted for 19.8% of all Oldham housing benefit claims. St Mary’s (014) houses 8.6% of Oldham housing benefit claimant’s the highest rate in Oldham & 59% of ward females are economically inactive. So how will the planned 800 new homes that straddle St Mary’s (014) and Oldham Town Centre (024) benefit the Oldham economy when so many already directly and indirectly contribute nothing but put huge pressure on services and infrastructure? 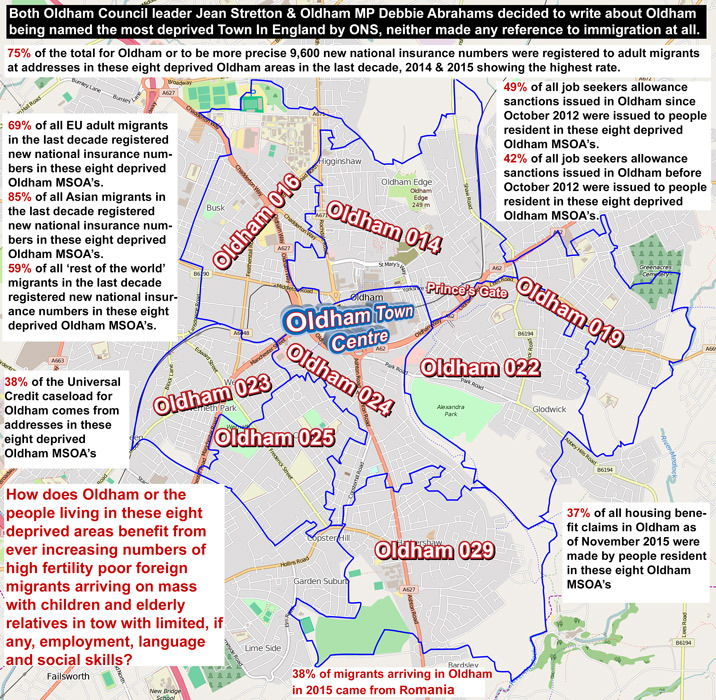 (024) currently has the highest immigration rates in Oldham with over 55% of migrants in 2016 being of Romanian nationality & over 76% originating from impoverished Eastern European EU2 & EU8 countries. 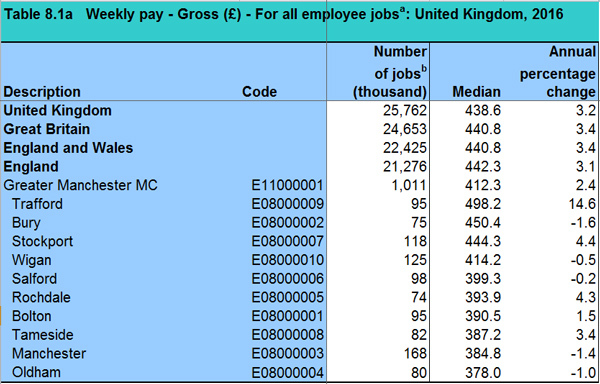 Oldham ward’s have the highest percentage inflow of unskilled migrants in all Greater Manchester. Clearly Oldham Council is more concerned with increasing council tax and footfall in Oldham Town Centre regardless of the fact money spent will come from council tax benefit, tax credits, child benefit, housing benefit all of which are subsidised by the few who pay for the many. Continuing to import poverty on mass to the poorest town in England with no strategy except see no evil hear no evil speak no evil is yet another socialist long term economic and social disaster in the making, you really could not make it up.